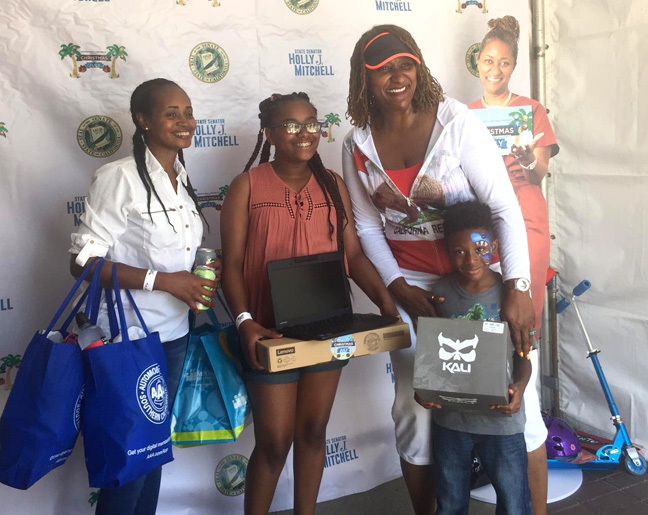 Senator Holly Mitchell’s ‘Christmas in July’ Brings Joy to Families; Sen. Mitchell’s annual carnival affair invites fun filled activities and resourceful services to the community. The holiday season arrived early Saturday July 15, as families came out to USC to enjoy the summer heat at the 7th annual “Christmas in July” affair, hosted by Senator Holly J. Mitchell representative of the 30th District of L.A. .
Held at the McCarthy Quad on the University of Southern California (USC) campus, Mitchell joined L.A. residents in celebration by staying active, connecting, and participating in activities with youth. She bridged having fun with staying mentally, physically and nutritionally active during the summer. Senator Mitchell presented laptops, donated gift bags, helmets and scooters to over 150 at-risk youth, ages 7-12 and their families during a free carnival including food, games, rides, athletic and outdoor challenges as well as arts and crafts. 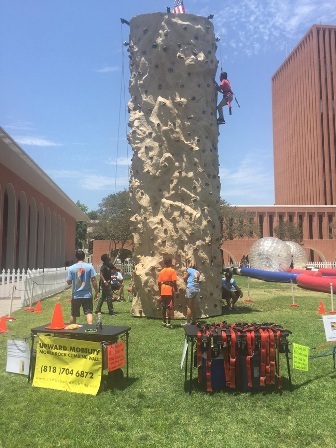 The event was filled with “fun zones,” including rock climbing, sumo wrestling, playing in an inflated “bounce house” and much more. The annual event inspires and promotes positivity, while cultivating stability and progression among families and youth in South Los Angeles. “Christmas in July” encourages the community and uplifts the lives of at-risk children by allotting them a free space to congregate and gather information on businesses, organizations and government funded services that aid local neighborhoods. Mitchell provided the children and their families with valuable services such as free dental, vision and medical screenings. The festival held onsite education, environment, and literacy workshops as well as health, science and literacy labs to help raise awareness of subjects like healthy eating and financial literacy. “Christmas in July gives at-risk youth an opportunity to enjoy the summer with engaging activities, learning opportunities and the encouragement to excel,” said Senator Mitchell. She is committed to the community, using such events to show support to underserved children and their families. Senator Mitchell continues, “everyone feels philanthropic during the holidays, frp,Thanksgiving with free turkeys and Christmas with toys and trees. However, summer times are hard for working families. There are no free or reduced breakfast or lunch. Summer camps are very expensive. So we decided that we would celebrate Christmas in July and have a big festival and bring resources to the table, so that families know what is available during the summer,”she said. A native Angeleno. Mitchell spent all of her summers reading and riding her bike, and wanted to expose reading as well as physical activity. All of the families who participated received a laptop and scooter, to encourage them to get some physical activity in, as well as reading, prior to school returning in September. As Senator of District 30, Mitchell represents neighborhoods: Culver City South Los Angeles, Crenshaw District, USC, Downtown and pockets of Inglewood. Mitchell is an advocate for Los Angeles youth and has spent her professional career protecting disadvantaged children and families. She headed California’s largest child and family development organization, Crystal Stairs and seeks to improve children growing up in poverty. Aside from the festivities and workshops at the carnival, Mitchell discussed the ongoing issue of juveniles and young adults in the criminal justice system. There is an increasing number of children 18 and younger being brought into custody and asking to waive their Miranda rights and submit to interrogation effecting their future. Young people who are interrogated without an attorney are much more likely to confess to a crime they didn’t commit. I’m carrying a package this year, its seven bills for #Equity­andJustice,” sayd Mitchell, who partnered with colleague Senator Ricardo Lara and it is focused on juvenile justice reform. The two spent a lot of time talking about adult juvenile justice reform, but children defense fund report issued a study 10 years ago. That is when they coined the phrase the “cradle to prison pipeline. Mitchell says these bills are put in place to eliminate that phrase. “There are six other bills in the package and I’m proud of the package; it deals with everything from children who should not be able to waive their Miranda rights because they are children and don’t fundamentally understand what a Miranda right is,” she said. Many organizations were on hand to lend support the community at the Christmas in July. “We are here to support families, children and the obesity epidemic. L.A. County offers the Cal fresh program that allows families from a lower income to have greater access to healthy foods from grocery stores and farmer’s markets,” states a rep from the Los Angeles County. Similar to health, literacy was a popular booth at the fair, “We’re encouraging reading. The early they can start the better the kids, the community, the better we are. Famous Friend is an organization that arranges phone calls from celebrities,” said Famous Fone Friends. Tom Kenny (“SpongeBob Square pants”) and Bryan Cranston (“Malcom in the Middle” and “Breaking Bad”). We have this booth and we give out books to participating kids in “Christmas in July,” this is our fourth year. We give out scripts to the children who’ve won scripts,” states Linda, representative of Famous Fone Friends. Along with organizations and sponsors, volunteers and locals were of no shortage and were eager to be a part of the festival. “It’s good for the kids that, they get to learn new things. Kids need to do this as often as possible so that they can be active and involved, said a mother looking on as her child climbs the rock. The 7th annual “Christmas in July” affair was sponsored by Disney; County of Los Angeles; American Beverage Association; USC; Wells Fargo; Farmers In­surance; Intuit; Upscale; Com­munity Partners; AEG; Alta Med; AT&T; California American Water; CHLA; CVS; IBEW Local 11; Kaiser; LA Care; Water Re­plenishment District; NBCUniver­sal; SEIU 721; SEIU 2015; St. John’s; State Farm; Toyota; US Bank; Walmart; Paramount Pictures; Sunrun; Local 871; Avery Dennison; Enterprise; GRACE; Google; Green Dot; Servicon; Molina; SoCal Gas; Zenith; Warner Bros.; HBO and 2nd Call. For more information, visit Senator Mitchell’s web site at www.senate.ca.gov/Mitchell.